It’s true that you cannot resume the party without Balloons Decoration. Balloons are become an important source to bring fun and happiness in celebrations. Whether it is a milestone event or a wedding anniversary, simple corporate event or grand wedding ceremony, in every celebration balloons lighten up the party atmosphere. Here we have added some beautiful tips of how to sparkle your party with vivid decorations of balloons. Irrespective of age and time balloons are the most budget friendly and charming decoration for all types of events. So here we go, please check the decoration type right down here. It is impossible to assume the kid’s birthday party without balloons. Helium filled balloons add an extra joy into kid’s party. How beautiful when kids see the balloons are floating in the air and they love to move and jump to catch balloons. Keep in mind tie a long string at the end point of balloons so they can enjoy playing with it. If wish you can also call a single big sized floated balloons to make your little ones day very special. Helium filled balloons stay for longer hours so you can use to give it as a thank you favor at the end day of the celebration. 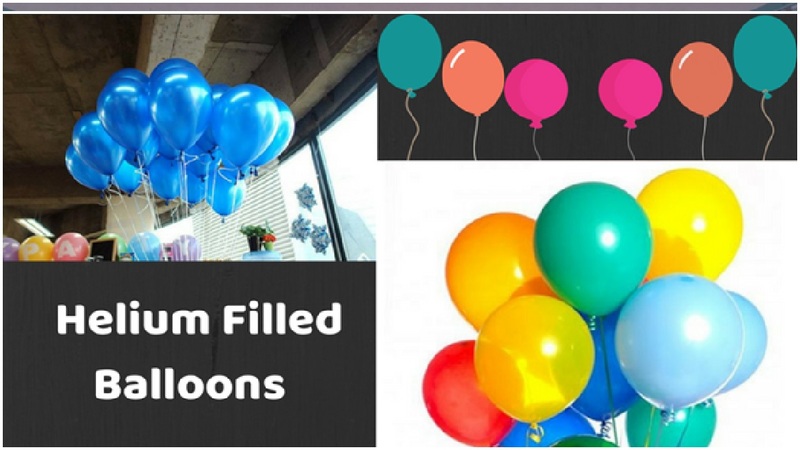 If you are following the adult celebration or baby shower you can uplift the party mood by hanging the floated balloons with chair or on the center table. You can ask the balloons color and size as per the theme of party. It is easily available on online shops. Décor your special one’s celebration with colorful air filled balloons. Either it is a birthday bash or naming ceremony or a high profile wedding ceremony balloons create a magical effect on the special day. Non-inflated balloons are easily available in super market. You can float these balloons before the time. You can make a decorative garland of these air filled balloons to make a creative backyard. For more creative idea leave balloons in the party room and let the guests enjoy touching it on feet. Children can dance with it; play with it and taking memorable snaps with it. 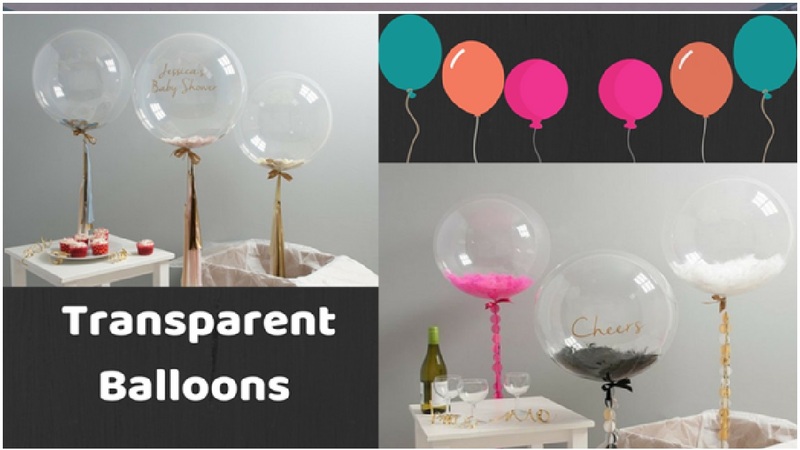 Transparent balloons best suits to give a surprise gift to a special person in your life. It’s a great decorative element for children’s room. You can use the big sized balloons filled with soft furry animals or light weight gifts. Kids would love to pop it and get the special surprise hidden inside the balloon. Soft pink or sky blue color decoration is perfect for baby shower celebration. If you wish you can also add glitters into it to sparkle the party. Smiley balloons are being a part of joyous celebrations. You can transform the simple boring party into enjoyable celebration by adding a little smile into decoration. 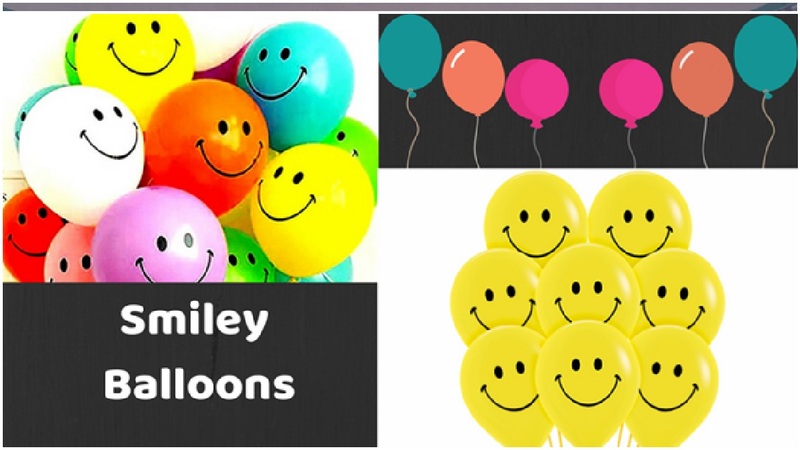 Smiley balloons are great decoration type to make everyone smile. Yellow is the color of joy and happiness, so it is the great choice for adding extra entertainment in party. You can easily spread joy and happiness around by decorating the walls with yellow smiley balloons. 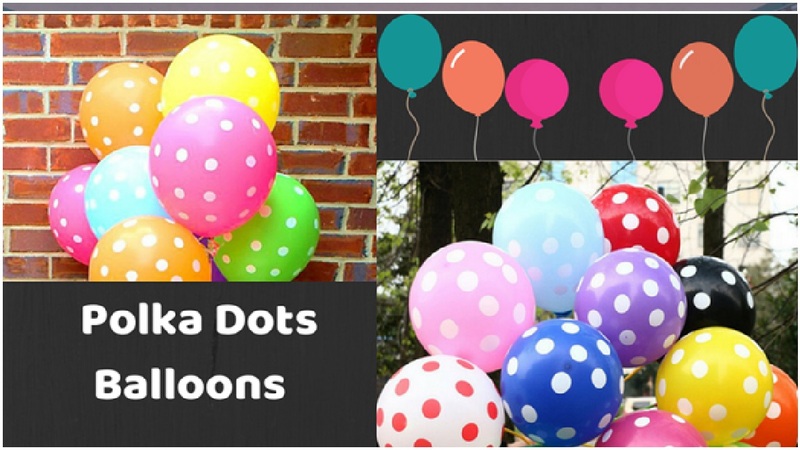 Polka dots balloons are very traditional type used in 70s and 80s time. Bring back those special memories by adding a vibe of historical trend. Don’t stick to one color; you get so many colorful polka prints on balloons from balloons delivery NYC. 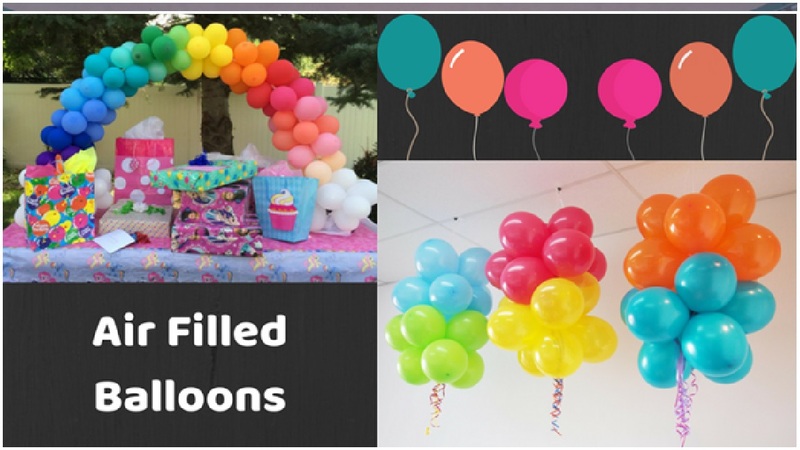 You need to manage the balloons color and size as per the theme of party. It is available in both air filled and helium filled types. Now it’s on you which type of balloons suits to your party atmosphere. If you wish you can mix the polka dots with simple balloons to get an eye-catching decoration to amuse your guests. 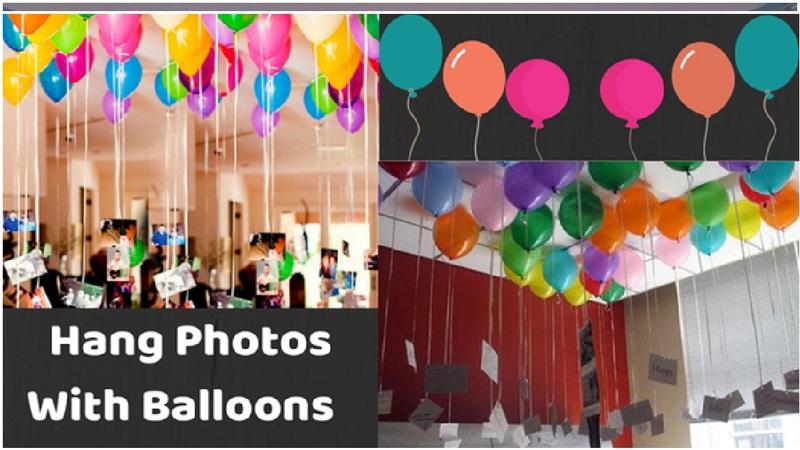 You can relish the special memories by hanging photos with balloons. Celebration ends in one day but the memories lasts forever. You can make this moment an unforgettable journey by adding a memorable. Likewise hang memorable photos on helium filled balloon’s thread. Let it float throughout the celebration. Every photo will tell a tale of gratitude, love, care and concern. If you wish you can also ask for photo balloons that are now accessible in balloons delivery shops. Hereon can use number balloons to specify the age celebration and hang a memorable journey of successful years. You can pursue the same idea in wedding anniversary celebration. You can opt for printed balloons instead of using dull and boring simple balloons. Printed balloons decoration is crowd pleasing. It is used in various theme parties like Halloween, graduation and many other vibrant parties. 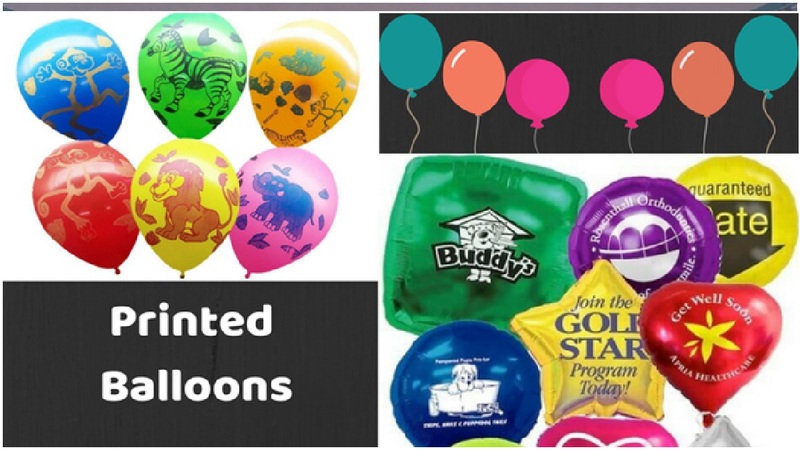 Printed balloons come in vivid designs with so many colors as per the seasons flow. You can print your special message on it to get the special attention. Guests are surely going to impress with such a creative idea of balloons decoration. You have all the freedom to use your senses to make up the balloons. You can use balloons and get the exact decoration you wish to. You have to use it for making a good decoration for party. We have included some important tips to use myriad balloons to make celebration happening and delightful. You can use these ideas to get the comfy decoration in no time.